A San Francisco cop with little regard for rules (but who always gets results) tries to track down a serial killer who snipes at random victims. BEFORE: This short Clint Eastwood run ends today with one of the actor’s more famous roles, Harry Callahan. 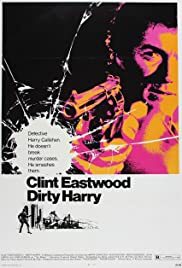 Unlike Gran Torino and Blood Work, Dirty Harry is not directed by Eastwood. AFTER: “You’ve got to ask yourself. Do I feel lucky? Well do ya, punk?” One thing you learn early on is that Harry Callahan (Eastwood) doesn’t like anyone and you’d be best staying as far away from his as possible. The film, which follows Callahan on several of his assignments, mainly tracking down the Scorpio killer, is decent. The pacing keeps things moving but as far as cop dramas go, it wasn’t that exciting. There was an energy that was lacking in both the chase and conversation scenes. All that energy was funneled into the two main characters, Callahan and the villain, the Scorpio killer (Andrew Robinson). These characters are some of the best out there and are the best part of the film. Dirty Harry is great anti-hero who does good, but with questionable methods. And then there’s Scorpio. He isn’t the greatest villain of all time, but he is one of the best psycho-villains. Robinson just portrays the perfect mix of creepy, psychotic, and a little bit of menace to freak you out.